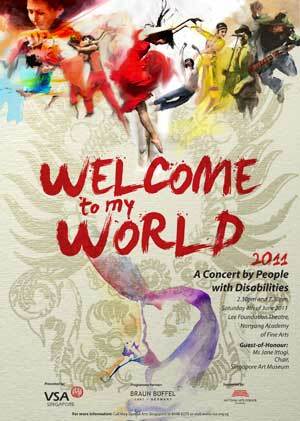 Very Special Arts has invited us to perform at their concert “Welcome To Our World 2011 for the 3rd time in a row. Through this concert,VSA hope to create a platform for disability awareness through showcasing the best talents among our people with special needs. We also had integrated a whole section dedicated to song-signing to the rap part of the song which Ammar had killed with swag. We hope that it would bring awareness to our language used in the deaf community. Thank you Very Special Arts for the endless support and people who had come to watch us for their great support in the event. 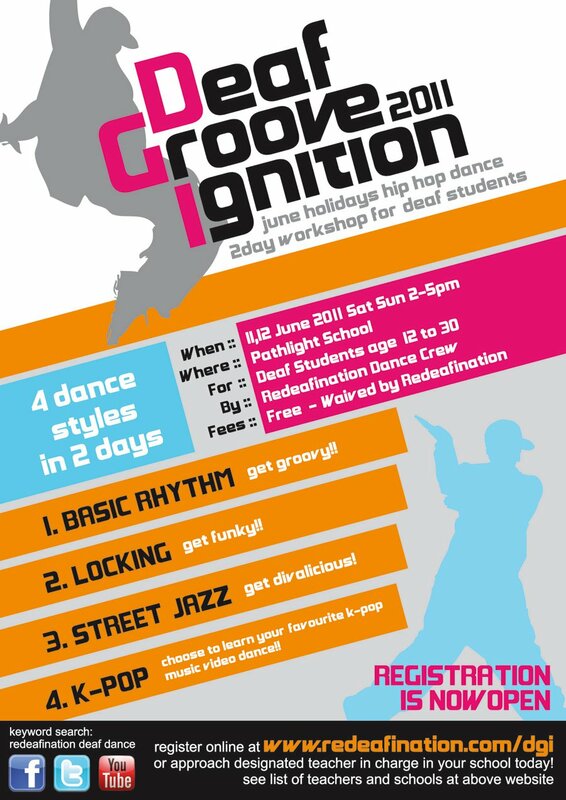 Deaf Groove Ignition (DGI) started in 2010 with the objective to provide hip hop dance training exposure to Deaf students who currently has very little or no learning opportunity in this arena. DGI is back again in 2011! Thank you for making the year such a sucess and hope next year will be even better! Marking the end of the year-long collaboration with NRA (New Revolving Age), Redeafination took the stage with 8 NRA counterparts, performing a locking piece for the opening act and bringing back “Defunct Resurrected” as part of the concert’s storyline. One of the highlights of Danzation also included “Dreams”, a performance item comprising of several dance styles woven together with song-signing. Danzation 2011 would be the first dance event in Singapore made 100% deaf accessible, with a Deaf area reserved in the auditorium and two interpreters to match the two hosts of the show. Redeafination would sincerely like to thank everyone for their support over the past year and for coming down to watch us perform. From here on, it can only get better. For the 2nd year running, Redeafination was invited by the Singapore Association for the Deaf to perform at a celebration for the International Day for the Deaf. This time, the event was held at the Raffles Hotel on the unique date 10/10/10. We’ll like to thank our friends in the Deaf community for continuing to show us support in all that we do. New Revolving Age (NRA) is a dance crew based in Ngee Ann Polytechnic. They have had dance workshops with Redeafination in the past. This led to the idea of having us as a guest feature in their upcoming biennial concert, Danzation. This would be the 1st long-term collaboration among Deaf and Hearing dancers. It was a huge project to take up, with lots of commitment involved: Training was done on a weekly basis, though increasing in frequency as the concert drew nearer. Our dancers were exposed to several styles of dance, such as B-boying, Jazz, Locking, House and different interpretations of Hip Hop. NRA Dancers, on the other hand, were introduced to sign language and a basic understanding of Deaf culture, in a first-ever customised sign language course that covered both the basic syllabus of sign language as well as dance terms in further detail. All of the dancers successfully completed the course with a 100% pass rate, having been taught by local sign language instructor Lily Goh, at the Singapore Association for the Deaf (SADeaf). Dancers were needed for the opening ceremony of the Youth Olympic Games (2010) . The audition, which was held at O School, led to the participation of over 150 people, 8 of which belonged to Redeafination. While we did pass the audition, only Geeta was able to fully commit to the training schedule, and continued to attend rehearsals for the item. It was the 1st time a deaf dancer was accepted through a public audition, and definitely quite an experience for Geeta. Redeafination was invited to perform at the Esplanade’s Outdoor Theatre as part of the very 1st 4Flo Hip Hop Festival. * If You’re Happy And You Know You Clap Your Hands! … was truly an eye-opening experience for all of us. The crowd was amazingly supportive, with members of the audience from both the Deaf community as well as the local Dance community. Knowing that we reached out and inspired several people made all the months of effort worthwhile. We are proud to feature a debut locking choreography from Jannson as well as the debut dance performances from new members Nicholas and Ricky. You may view the video of the performance here. We’ll like to thank Miss Dewi for inviting us and everyone for their continuous support! 19th June and 20th June. What is so special about those two dates? Yes! We conducted our very first Deaf Dance Workshop, “Deaf Groove Ignition”! With the aim of inspiring more young deaf people, we taught 4 different styles over two days. Day Two : Street Jazz and Entertainment Style. We had a good response, better than what we had expected ; around 15 deaf partipants including the Redeafination members! Thank you so much for making this event a sucess! Redeafination collaborated with Sign.It to set up a deaf dance induction course for hearing dancers who would be working with the club, Alvan and David were the main instructors for the workshop, introducing deaf culture and visual communication to the participants. They also learnt a number of dance terms which was specially for the workshop, such as ‘bounce’, ‘ isolate’ and so on. We believe that it will be useful in the future collaborations with the club! We, Redeafination thank you Rhythm Stylus and NRA for coming to the workshop! Redeafination was engaged by Singapore Association for the Deaf to perform at their event to celebrate International Day for the Deaf (IDD) 2009. The event was held at National Museum of Singapore. We received very warm response from the Deaf audience. Many expressed pride in the achievement of our hearing impaired dancers. Redeafination was also featured by various media for this event. We would like to thank our peers in the Deaf community for the support. We will continue to do you proud! Redeafination (RDF) is a hip hop dance group for the hearing-impaired. Formally under a VWO parent organisation, RDF are now a self funding independent performing arts group. Through the universal language of dance, RDF seeks to promote Deaf awareness as well as to nurture and develop performing arts talents within the Deaf community.